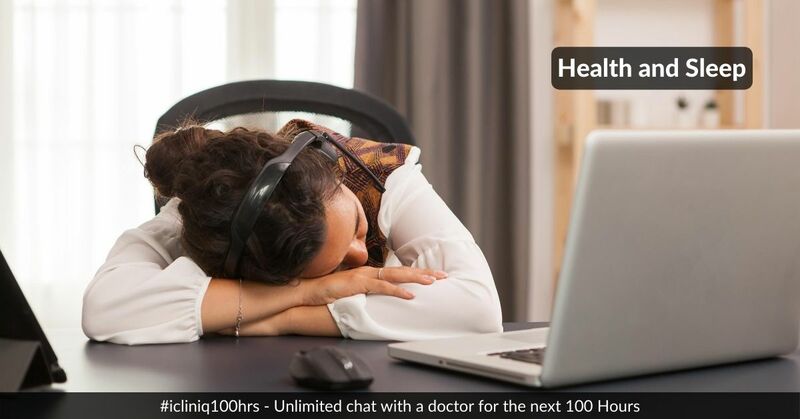 iCliniq › Ask a doctor online › Health Articles › Sleep Disturbances › Health and Sleep: Two Interconvertible Words!!! Health and Sleep: Two Interconvertible Words!!! Maybe you are stressed and already busy in a fix of life's untiring tasks. There is a lot of lacking behind when you look at your schedule and calendar is always showing you dates ahead of what you are expecting. Who will have time to sleep enough in these moments of life. Many of us think this will be a waste of time is spent on sleeping. But, we forget what sleep actually is and why we actually are lacking behind the schedules. Our whole body including brain needs proper spells of a sound sleep and that too in a periodic way to work optimally and give us the best output as needed for us. Sleep is the key to fast reflexes, long term memory and remote usage of skills and knowledge. Success is the other name of balance in our sleep-wake cycle. We forget in the hustle and bustle of modern life that keeping a balance in the sleep-wake cycle will make us more attentive and the work done will be more fruitful and quality oriented. Working hard is not needed, working smart is only needed in professional life. This can only be achieved through freshness from sound and peaceful sleep. Will fasting and lack of sleep cause delirium? Chronobiologists describe the day and night (light and darkness) cycle to be present in human body named as circadian rhythm. It is based on the number of hours of daylight and the same for the night. Our body adjusts itself accordingly. The pineal gland in brain secretes melatonin hormone in response to the night or darkness. Melatonin is implicated as the chief controller of the circadian rhythm. Not only humans but animals body system also follow this cycle. That is why we should respect the call of the zoo management for evacuating the zoo after sunset so that all lights must be off to avoid disturbing the circadian rhythm of the animals. If you do not get enough of the needed sleep, what may happen to you?? No clarity of mind to help you get better reflexes, learn new ideas, remember and apply learned skills and knowledge. Lose temperament and easily get angry on minor happenings and feeling depressed most of the time. Fine motor skills get compromised, for example: handling machinery at work or driving a car. The tired body becomes more vulnerable to get ill and derange your schedules. Motivation is lost if you are deprived of sleep. Loss of achievements and it makes you lack behind your peers. How Can We Get Better Sleep? Early to bed and early to rise. Go to sleep and wake up at the same time daily. Keep a balanced regular physical activity from the very beginning of your life and remain active throughout life. Food is for energy. Many foods give us instant energy, and if we eat near to the bed-time, it will cause difficulty in sleeping. Have dinner early and take a light dinner. Darkness is the other name of sleep. God created darkness to tell our body that it is time for rest. Do not disrupt this natural balance of the body by watching television, using a smartphone and other bright lights at night. Your bedroom should be the least lit area of the home. Going into the bedroom itself will take you to sleep then. Modern science has proved that people with loose clothes and in a properly maintained temperature environment sleep more comfortably. Leave your worries outside the bedroom. Feel like passing through a filter paper when entering the bedroom from the living room. Taking a shower after finishing all the tasks, will help your body realize that it is the time to relax and you will feel in a few days that your body muscles get flaccid and relaxed after taking a bed-time bath. Go to bed only when you are feeling almost sleepy. Going to bed afresh mostly leads to bad sleep habits and you are more likely to remain awake longer. In such cases, I advise reading your favorite book, novel, digest, story, etc. It will be the second trigger for a bout of sleep to come and take you into a deep sleep. The moment you feel sleepy again, just leave the book and let yourself go into sleep at once. Some of my patients said it did not work. On asking, it came to my knowledge that they went astray while reading their favorite novel. It was so interesting that they forcibly kept themselves awake just to finish the novel and then were sitting sleeplessly in the bed once again after missing their second and most fruitful trigger of sleep. There should not be any television, laptop, smartphone, tablet or any other gadget in the bedroom. Make it a lifetime rule. In dinner, there should be no tea, coffee, beverages, energy drinks, alcohol, and cigarettes. They interfere with your sleep cycles. If you need to sleep in the day, do not go to sleep for longer than 20-25minutes. It is better to take a nap on the sofa, recliner or any place where you will most probably be having interruption after some time. Longer naps make night's sleep of poor quality. Writing down your daily tasks on a whiteboard, paper or in your smartphone notes/worksheets at the start of the day makes the day easy. After the busy day, if some tasks are still left undone, write them down once again to take them off your mind. It will be a deed of responsibility, and our mind lets our body get relaxed easily if we show we are responsible and will not let our self-esteem down by just forgetting some important daily tasks. Comfortable bedding, soft and super-fitting pillows, darkness, no noises, proper room temperature are some of the ideal necessities for a sound sleep. The number of sleep hours needed for an average human being is between 6-9 per 24 hours. But it is not only the number of hours needed to sleep. Quality sleep matters a lot. Reason for a poor quality sleep may be snoring, anxiety, depression, tension headache, migraine, temporal arteritis, glaucoma, uncontrolled diabetes leading to polyuria (frequent urination) and nocturia (waking at night to urinate), hypertension, pain in the body, etc. If you cannot get up easily in the morning, unable to focus on important tasks of daily life, or lacking behind your peers, the reason may be sleep deprivation. Try the tips aforementioned and you will definitely get better sleep and will have a chance to excel in your life. Do you have a question on Sleep Disturbances or Lack Of Sleep?